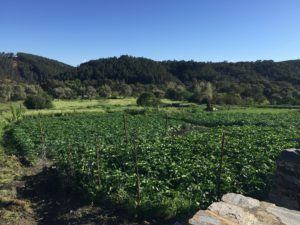 The intensification of landuses through agriculture constitutes the driver of change with the largest pressure on biodiversity in Spain. The so-called “conventional” management is the result of the industrialisation and mechanisation of agriculture since the 1960s-70s and aims at maximising crop production. As an alternative to this conventional management, he “agroecological” management model is characterised by applying the principles of ecological functioning of agroecosystem and integrating principles of social and environmental sustainability and justice. A typical agroecosystem where both management models are used are fruit and vegetable gardens. In mountain areas many subsistence homegarden were abandoned but are being recovered, under different management regimes, by elders or “new peasants”. The objective 3.2 of REVERDEA project aims at “Characterising the role played new ruralities in the ecological dimension of the contexts in which they land, including the impacts on biodiversity of different agricultural management models”. We have been reporting through chapter I and chapter II of a mini-documentary, about how do ants contribute to better understand the functioning of gardens. 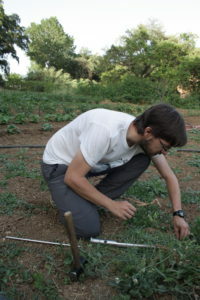 The past February 17th 2017, Álvaro Fuentes García presented his MSc Thesis titled “Taxonomic and functional diversity of ants in vegetable gardens under different management regimes: agroecological vs. conventional”. This work is framed within the Postgraduate in Ecology of the Autonomous University of Madrid and has been awarded a mark of 9.5/10. 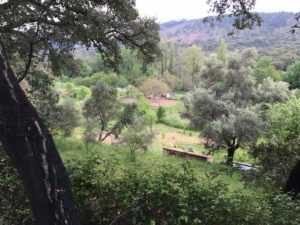 The work was developed in two areas the Sierra de Aracena (Huelva). The fieldwork was done in summer 2016 through pitfall traps located both inside 24 gardens and in their surroundings. We have analysed taxonomic diversity (Species richness and diversity), the community composition, and functional diversity through five functional characters. The preliminary results show all these variables vary according to the valley (more ore less humid and fresh) and the position in the garden, more than according to the type of management. 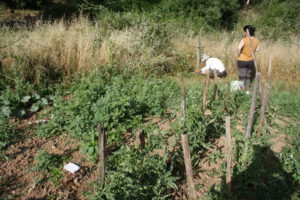 Small homergardening seems to be a low-impact activity so that even what we have considered “conventional” practices do not differ much from the “agroecological” one. However, we are still exploring the potential effect of certain precise environmental and management factors, such as the distance to watercourse, the size of the garden or the type of irrigation. This preliminary results were presented at the X Conference of the Spanish Association of Terrestrial Ecology (AEET) and the International Society for Mediterranean Ecology (MEDECOS) that took place in Seville between the 1st and the 3rd of February 2017.